Graham Bavington, Realtor : Burr Properties Victoria Ltd. : Blog posts labelled: to fsbo or not to fsbo (for sale by owner)...is that the question__ Forget scouring the web for the greatest insight in all things Oak Bay. It's here...Oak Bay 101. yes. Posted in: To FSBO or not to FSBO (For Sale By Owner)...IS that the question?? Q: Why should I pay an agent to sell my home rather than sell it on my own? A: Want to hear something funny? After six months of trying to sell his own home, the founder of the #1 website people use to sell their own homes sold his home...using a real estate agent. You may have seen the current TV ads warning you that if you don't use a real estate agent, you'll end up living next to a bunch of aging nudists. But I think there are even more compelling reasons (after all, what's so bad about aging nudists?) 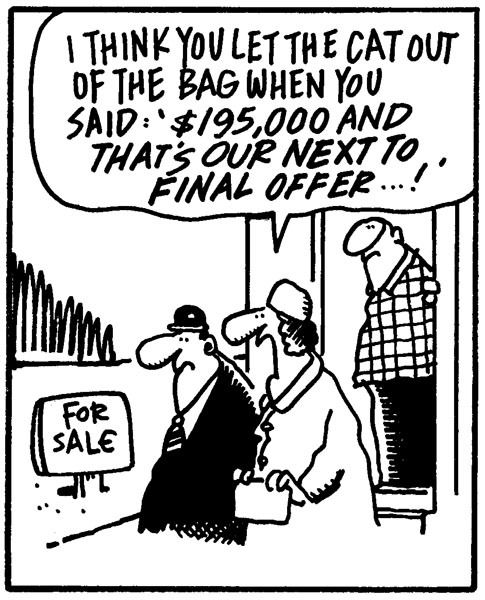 to reconsider no using an agent, whether buying or selling. While you may think you're saving yourself 5 or 6% in agent commission by selling your home yourself, according to statistics, FSBOS (For Sale By Owners) sell on average for 8-13% less than agent-assisted homes. 90% of all homes that are sold in the market are listed with a real estate agent. All power of sales are listed. Don't know if you've noticed, but banks like to make money. If banks thought they could easily sell these places on their own, I guarantee they wouldn't bother hiring a real estate brokerage to do the job. I'm not telling you all this so that you'll run out and list your home with an agent (okay, I kind of am, in fact, if you're thinking of listing, why not shoot me an email and we can talk about it) but I just want to counter so much of the current chatter that agents are a waste of time and that we don't do anything but throw your home on the MLS and then sit back and wait for our commission cheques to roll in. While we have heard in the past stories of bidding wars and homes selling in days and even hours after they are listed for bundles above their asking price, that is simply not the reality in today’s market where accurate pricing is as critical as ever. A real estate agent knows the market, has the network to get your home seen by as many eyeballs as possible, knows how to negotiate for you and ensures that every "i" is dotted and every "t" crossed. I mean think about it really, can you afford not to hire a professional to sell your most expensive asset?